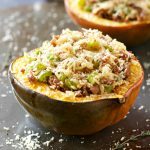 This Italian Sausage and Brown Rice Stuffed Acorn Squash is a deliciously healthy easy weeknight meal idea made with sausage, whole grain rice, and seasonal vegetables! Preheat your oven to 350 degrees Fahrenheit and line a large baking sheet with parchment paper. You'll be roasting the acorn squash first, so cut it in half and scoop out all the stringy bits and the seeds from the core of the squash. Since acorn squash have those beautiful rounded ridges on the outside you'll probably find it's difficult to get them to lie flat on the baking sheet with the inside of the squash facing up. To remedy this, use a large knife to slice off a little of the skin on the outside, creating a small flat surface on the underside of the squash. This works perfectly every time, and it will ensure the squash doesn't fall to one side while it's roasting or even worse, after it's been stuffed, spilling the contents all over the baking sheet. Once the oven has preheated, place the squash halves on the baking sheet (inside facing up!) and roast in the oven for about 40 minutes. While the squash is roasting, cook your brown rice according to the package directions. You'll need about 1 1/2 cups of cooked brown rice for this recipe. Heat a skillet over medium heat and add the lean Italian sausage, making sure to remove the casings so you'll end up with small chunks of meat. Once the sausage just begins to brown, add the diced onion, minced garlic and the chopped bell pepper and continue to saute until the sausage is cooked through the the vegetables are soft. Add the cooked rice and the fresh thyme leaves to the pan with the sausage mixture, stirring it around to let the rice absorb the flavours of the sausage and the vegetables. Once the squash has roasted for 40 minutes, remove it from the oven. Divide the sausage and rice mixture in half and spoon it into each of the squash halves. Fill the squash halves until they're overflowing, and sprinkle the Parmesan cheese evenly over each half. Return the squash to the oven after it's been stuffed and roast for another 15-20 minutes until the cheese browns slightly. The filling will settle in to the squash, making it easier to slice and serve!